Optimizing your resources allows you to increase productivity and profitability. Get total visibility into your resource availability and allocation with Eralis Job. With multiple jobs happening simultaneously, scheduling your team and other resources can be challenging – especially if you’re relying on basic applications, like Excel. 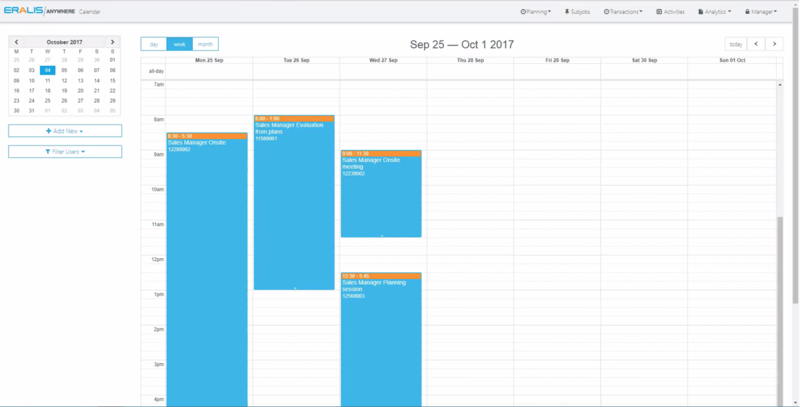 You need a robust tool that allows you to easily allocate your resources across jobs, make adjustments on the fly, and share the schedule with your team in real-time. With Eralis Job, you can do just that. Because the solution integrates directly into your SAP Business One system, you already have your job information available. From there, the intuitive interface allows you to complete your schedule and ensure each and every resource is being utilized effectively. Get total visibility of resource commitments across all your jobs in a single screen. Visual guides allow you to quickly identify resources that are being under or over utilized so you can make adjustments to maximize your team. Eliminate the manual effort of keeping your team up-to-date on job schedules. Eralis Job automatically notifies your staff of their assignments using the built-in SAP Business One calendar. Our optional extension, Eralis Anywhere, gives your mobile staff instant access to their schedule and job details. And they can easily enter time directly against the job activities – all from their laptop, tablet or smart phone.